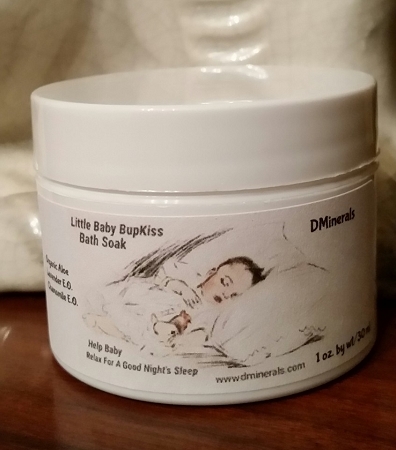 What a most wonderful way to end the day with DMinerals "Little Baby BupKiss" Bath Soak ! A calming,soothing bath just before bed can help baby relax and get a good nights sleep. Our calming Lavender & Chamomile Essential Oils give baby that extra loving care before bed. Our gentle baby soak dissolves instantly in the warm bath water ! Just mix 1-2 tablespoons into baby's warm bath water tested by mom !